Connor wasn't quite sure what to think about the pine wood derby. He was pretty excited at first and stoked that Dad put some weights in the back. I think he had convinced himself that he was going to win. When he lost his first run he was so mortified that he turned red and couldn't remove his hands from his face. It was nice that he had another try. He competed with what must have been the slowest car and this time he won. He got a ribbon and left with mixed feelings about the event... until next year. 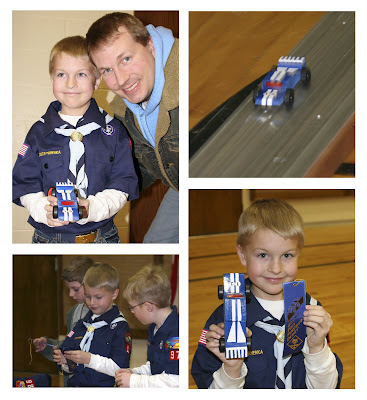 thank you for the good comment about my win on the pine wood derby. i had lots of fun on my first win ever in scouting. love,connor.